Hi! To make the most of this guide you should register at http://www.bt.cx first. If you have not done that already please klick here, and follow the instructions. 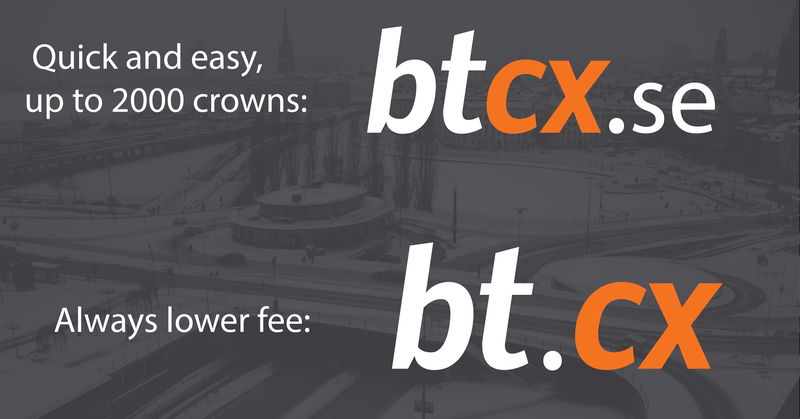 Go to btcx.SE – likely the easiest way in the world to get bitcoin. Get bitcoin for up to 2000 swedish crowns without registration. 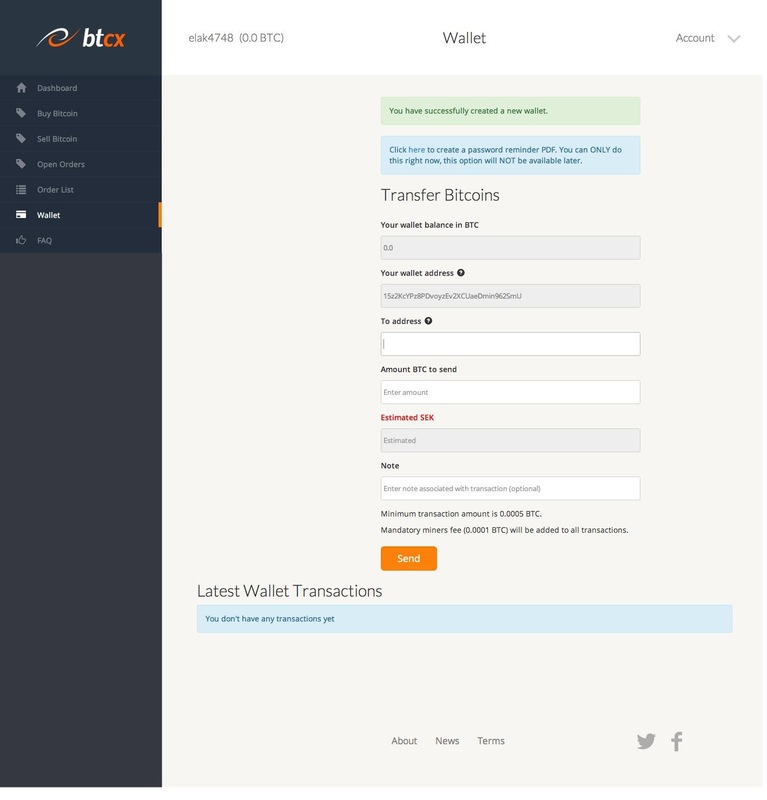 To create your BTCX|Wallet, press ”Wallet” in the row to the left. 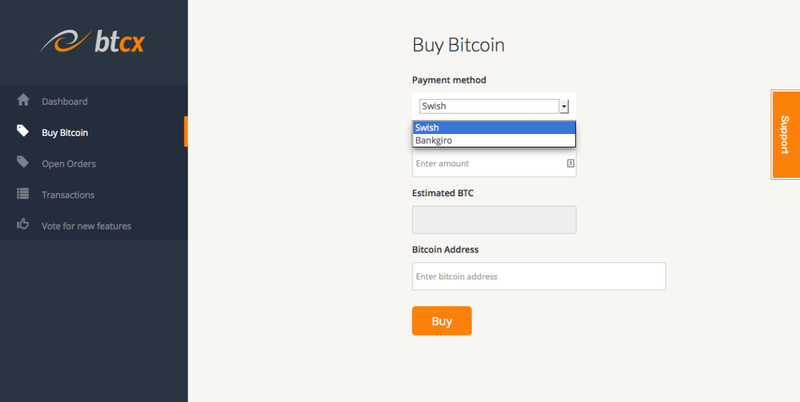 Then you will end up on the page below, where you are going to start you wallet and acquire a new bitcoin address. 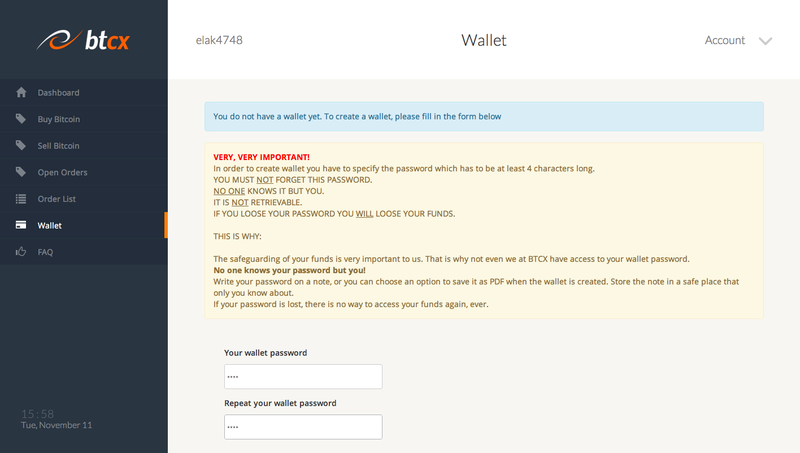 In order to create a wallet you have to choose and specify a password which must be at least 4 characters long. – IT IS NOT RETRIEVABLE! – IF YOU LOSE YOUR PASSWORD YOU WILL LOSE YOUR FUNDS! 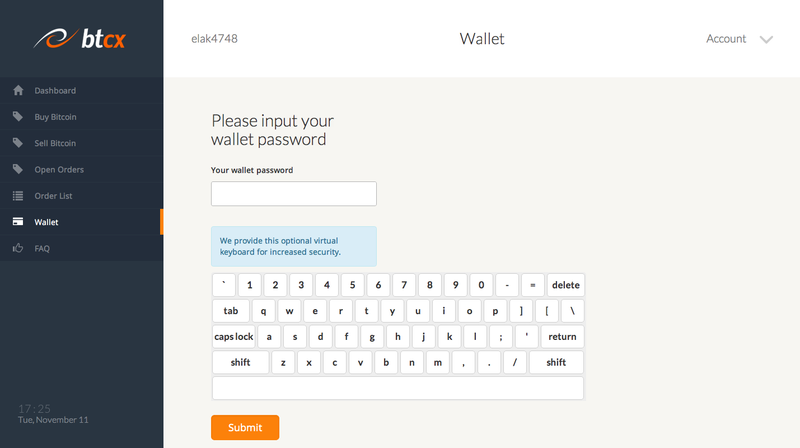 After choosing your password, you can press the ‘Create new wallet’-button at the bottom of the page. Your wallet will be successfully created as soon as you confirm that you remember your password. At this point, you will have the option to print a PDF document as a password reminder. WE RECOMMEND YOU NOT TO MISS THIS CHANCE! THIS IS THE ONLY OPPORTUNITY TO DO THIS, THE OPTION WILL NOT BE AVAILABLE LATER. 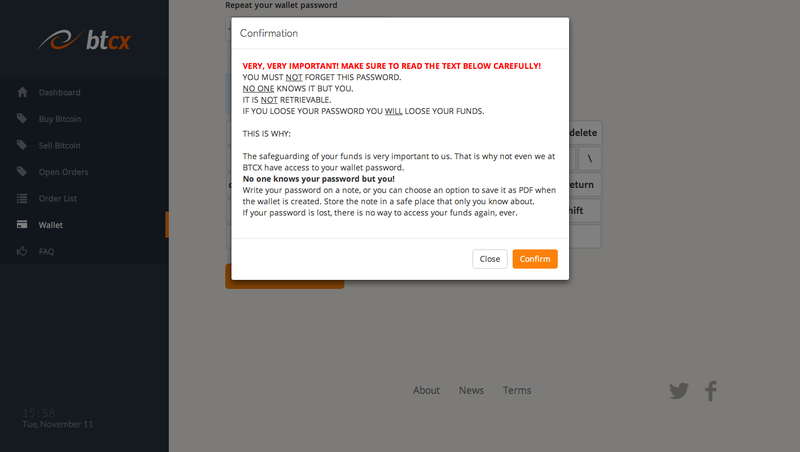 If you download the PDF that we provide, you can store your wallet bitcoin address and password in a safe place. After creating a wallet, you can access it using your wallet password every time you sign in to BT.CX. Press ”Buy Bitcoin” in the row to the left. Then you will end up on the page below, where you are going to place your order. 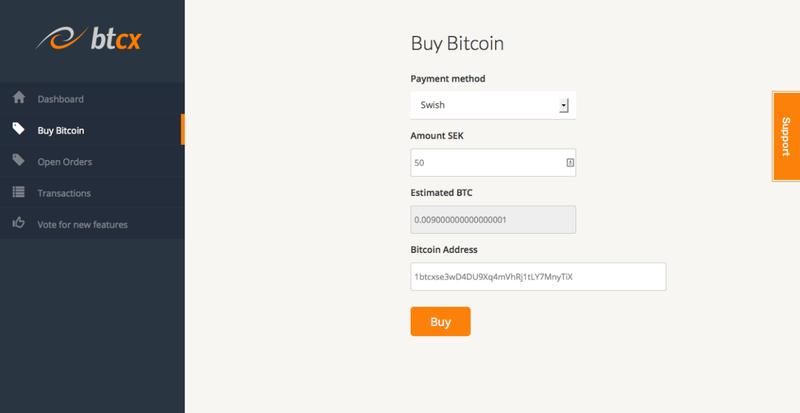 Choose payment method, then enter the amount SEK you want to buy bitcoin for in the field ”Amount SEK”. You will then see the amount of bitcoin that you will receive in the field below, ”Estimated BTC”. NOTE! This is an estimate. Sudden changes in the bitcoin price happens and your sum of bitcoin delivered might differ from the estimate in either direction, less bitcoin or more bitcoin. Then write the bitcoin address you want to use under ”Bitcoin Address”. NOTE! It is a very good idea to copy and paste your bitcoin address from the wallet you just created to make sure the address is correct. 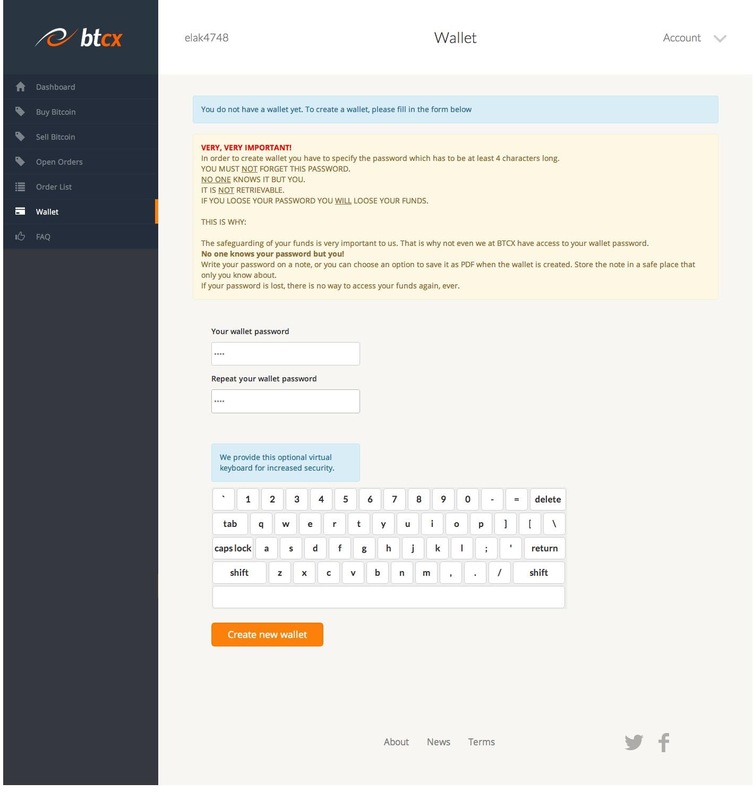 IF you put in a bitcoin address that is correctly written but you have no access to, then the staff at BTCX will have no way of knowing that something is wrong and we will make the payment. THERE WONT BE ANY WAY TO RETRIEVE YOUR FUNDS IF THIS HAPPENS. So make sure to put in the correct address. Then press ”Buy” to make your purchase. After pressing ”Buy”, you will see this overview of your order. Press ”Back” to make changes. To confirm it, press ”Confirm”. When you have confirmed your order you will end up on this page where you can see all the necessary information. You can print this page, that can help to remember it all, like your ORDER NUMBER which you NEED TO INCLUDE WHEN YOU MAKE YOUR PAYMENT, this is very important. 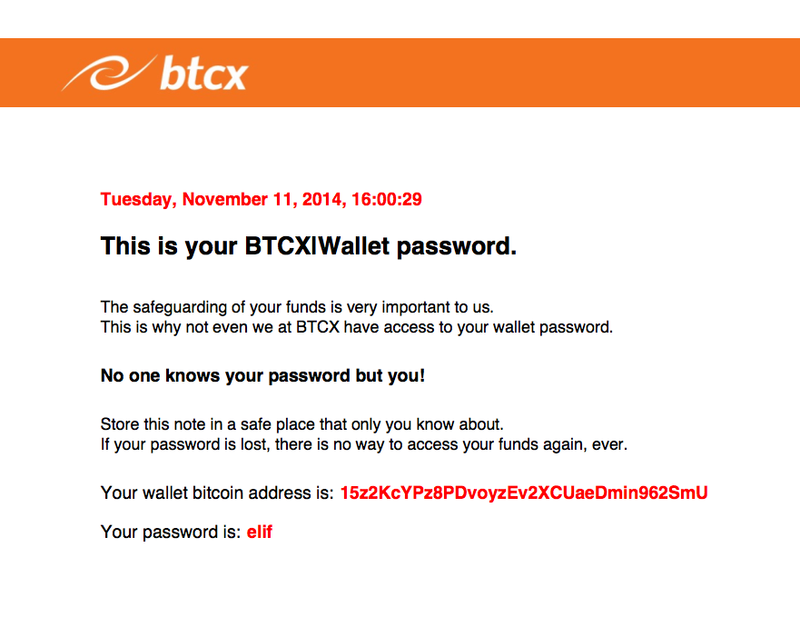 If you do not, our staff have no way of knowing that you you have paid us and will not send you any bitcoin. 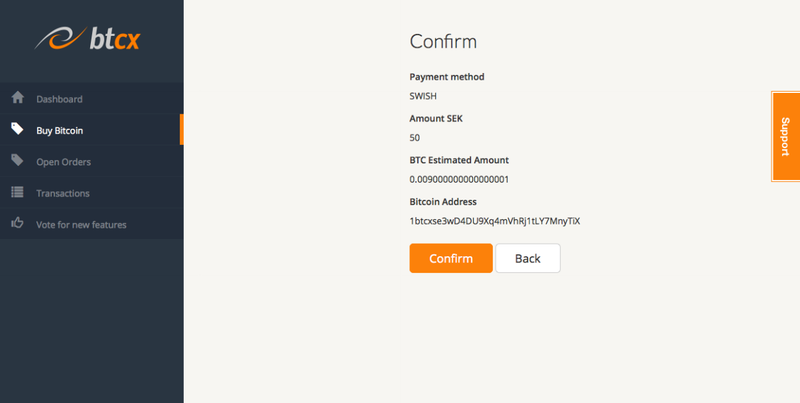 In red characters you can see the number that you are going to send your money to, if you use Swish. If you chose any other form of payment earlier, that payment information will appear here instead. At the bottom of the page you can print your order, look at an overview of your other orders and put in a new order. If you have any other questions, please do not hesitate to get in touch with our support team.